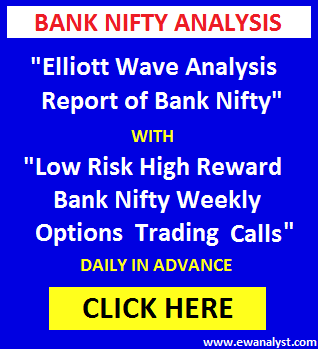 Bank Nifty opened higher at 25135, traded in 24919-25354 range for rest of the day with volatile swings and finally closed 77 points up at 25119. 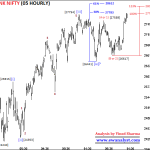 Friday, 25173 was the immediate breakeven point on upside and Bank Nifty was expected to bounce towards 25452-25525 if breaks and trade above 25173 continuously for 15 minutes. Trading strategy was to buy any suitable call of 04th Oct expiry trading around 60 if Bank Nifty trades above 25173 for 15 minutes with stoploss 27 expecting bounce towards 25452-25525 and Holding suggested for next day only if Bank Nifty closes near high of the day. Bank Nifty trades above 25173 for 15 minutes and 25800 Call of 04th Oct expiry was trading around 60-65 at that time, and same call bounced till 89 only and later hit stolposs of 27. Now, we need to analyze fresh charts to calculate further move. 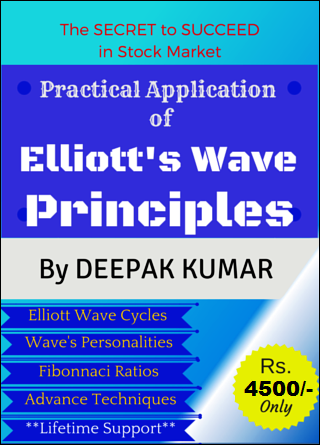 It seems wave completed from 28388-26555 may be wave (A or 1), wave completed from 26555-27205 may be wave (B or 2) and wave (C or 3) may be completed at 24678 or still in progress. 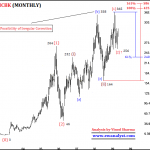 38% retracement of the progress of wave (C or 3) is placed at 25643 which is still immediate resistance/breakeven point on upside above which we can think of further bounce towards 26500-27200. Now, we need to analyze last bounce started from low 24678 on separate lowest time frame chart to check its pattern/immediate counts. This is 15 Minute time bar chart of Bank Nifty covering move from low 24678. Wave completed from low 24678-25525 seems corrective (abc) type but next wave completed from 25525-24919 also looks corrective (abc) type at this moment. But the bounce from 24919-25353 looks Impulsive which can be marked as wave [a or 1] and last corrective decline from 25354-24946 can be marked as wave [b or 2]. 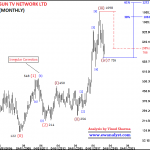 100%-123% projection for wave [c or 3] is placed at 25381-25483. 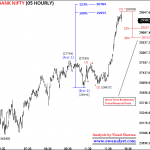 So, there is a possibility minimum bounce towards 25381-25483 if Bank Nifty manages to trade above 24946. Overall, (abc) bounce followed by (abc) decline is not giving hint of clear pattern, there is possibility of bounce towards 25381-25483 but with lack of confidence. But overall structure is indicating a sharp move either side. 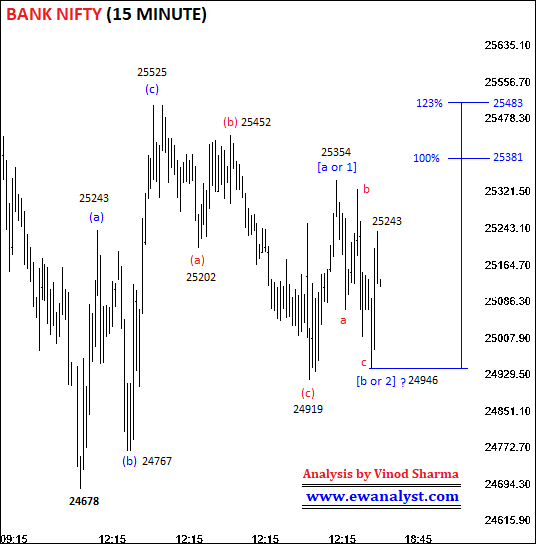 Bank Nifty needs to bounce sharply towards 25381-25483 otherwise we can see a very sharp decline for lower levels. 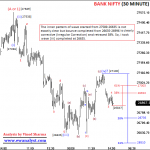 Overall, Bank Nifty is still in negative zone because it is trading below short term breakeven point 25643. 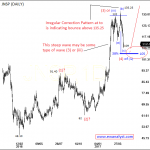 Any upside reversal can be confirmed after breaking above 25643 only. 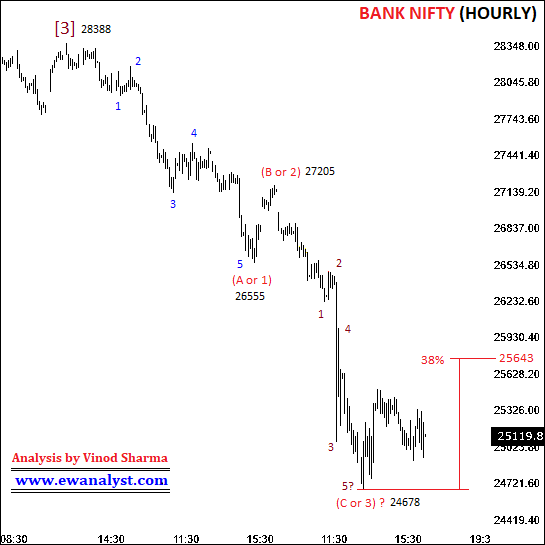 For Intraday/very short term, there is a possibility of sharp bounce towards 25381-25483 if Bank Nifty manages to trade above 24946 otherwise it can fall sharply for lower levels below 24678. Overall structure is indicating very sharp move of 500 points either side in quick time. 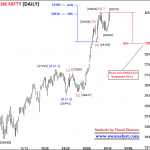 Bank Nifty is indicating sharp move of 500 points either side. 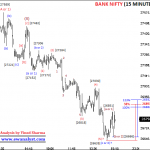 Bank Nifty can either bounce towards 25600 or decline below 24600 in quick time. This condition is good for buying Calls and Puts in equal quantity but Options are very expensive and Tuesday is Holiday, so I don’t prefer this trade right now. For 1 sided trade also, options are expensive and Tuesday is holiday, so options may not rise even after a 200-300 points move. I generally avoid option trade in such scenario but those who want to take risk can Buy Suitable Call of 04/11 Oct expiry for Intraday if get Bank Nifty in 25100-24946 range expecting bounce towards 25381-25483. Buy call which is trading around 60 with stoploss of 27 and initiate trade after 9:30 only. Be quick in booking profit trading in options Intraday because premium may decay because of Holiday on Tuesday. Bank Nifty can also decline sharply if breaks below 24946, so traders can plan their own trade based on the conditions explained above.